These are Triston’s sneakers. 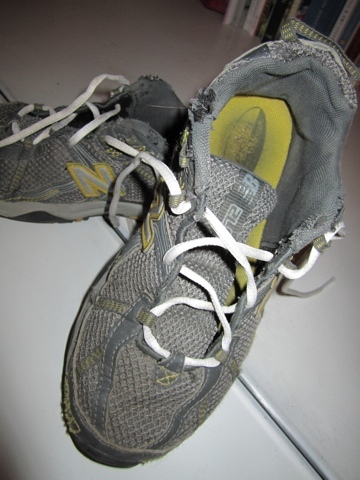 I put new laces on his old, beat up tennis shoes and I couldn’t help but think that I am so grateful that I am still having to do that for him. I love how tuff he is on his shoes, it speaks volumes to how active and full of life he is! Triston is my oldest (of 3) little monkey. He is 10 now. I took him up to Aspen on Sunday to a very special ski camp. This camp is for Children who are survivors of or who are currently in treatment for life threatening illnesses, such as cancer. The purpose of the camp is to keep hope alive in the kids going through treatment, to just help them to have fun and enjoy life! The organization that does this “Winter Games” camp every year is called ‘Shining Stars’. Triston is a cancer survivor. He had a large tumor in his abdomen called Neuroblastoma. We found the tumor when he was 19 months old. He went through several months of treatment, and luckily has been cancer free for almost 7 years now! When he was invited to go on this trip, I was so excited for him! I have heard regular updates from the special people watching over him, and he has had a blast. He has made friends with other kids who have survived and with kids who are still in treatment. My prayer is that when those kids see Triston, so full of life that they will believe they will be okay too! Hope is such a big part of recovering and surviving! We pick Triston up in Denver today, and I absolutely cannot wait to hear about the time he had! Yes, I am so grateful this morning that I get to put new laces on Triston’s sneakers. Grateful that he is still here so I can do his laundry, kiss his little face (whether he likes it or not), go to parent teacher conferences, ground him for hitting his brother, and all of the things that we have to do as parents. So grateful…. Previous Post Kabibi Mei On Celebrity Wedding Reporter! Cory, never, ever ever apologize for loving Triston like you do and supporting him. He is OUR HERO AND God has amazing things planned for our young Man!! Tell him Nanna loves him soooooooooo much and can’t wait to hear about his ski trip! !